Draft: 2012, Milwaukee Brewers, 10th rd. Anthony became a father in December with the birth of his son, Ayden Bryce...He loves tattoos…both arms are sleeved and he has a full chest piece…the design on his right arm took 19 hours, the left was 12 and his chest totaled 21 hours...he split the chest piece into two sessions and even had two artists working at the same time...he got his first tattoo at age 18 and continued from there…most of the art is faith- or family-related...he plans on adding more ink this year...Blake Snell and former Rays pitcher Chris Archer started calling him Tony Bandz in spring training last year to describe Anthony's alter ego on the mound…the name picked up from there and he plans to make it his Players' Weekend jersey nickname...Anthony loves to cut hair, including for his friends and teammates…he did it at Triple-A Durham, but not in the majors last year since the team has a regular barber…he makes a true hobby of it, including researching and buying new clippers and equipment…Anthony compares it to drawing and art, seeing the colors and lines blend together…he picked up the hobby in high school and hasn't gone to a barber since...Anthony grew up a Rangers fan in Texas…his favorite pitcher was Nolan Ryan but he started leaning toward Randy Johnson because he was a fellow lefty and the first southpaw he saw pitch live at any level…Anthony began to realize baseball is more than meets the eye after watching Randy pitch as a kid...The Big Unit visited Anthony's Double-A team during his time in the D-backs system and the two sat in the stands and talked for an entire game…it remains his all-time favorite baseball moment. Made 3 apps (1 start) over two stints with the Rays (May 12, May 15-26)…was placed on Triple-A Durham's disabled list on June 1 (left elbow strain) and underwent Tommy John surgery on June 14, performed by Dr. James Andrews in Pensacola, Fla....On May 15 at KC, made his Rays debut and needed only 52 pitches for his start of 5 IP…allowed an RBI groundout in the 2nd inning and an RBI groundout plus a Whit Merrifield RBI single in the 5th inning…averaged 94.3 mph on his 40 fastballs thrown, according to StatCast...At the time of his second recall, his 4 wins tied for 3rd in the International League and his 44 SO tied for 2nd in the IL...Was the 26th Man for the May 12 doubleheader at BAL but did not pitch...Acquired by the Rays during spring training, in the three-team, seven player swap with the Diamondbacks and Yankees on Feb 20...Ranked by Baseball America as the No. 21 prospect in the Rays system following the season. Made 8 apps (4 starts) over three stints with the Diamondbacks, his first career major league action…was on the active roster for a one-day stint on July 22, and from Aug 4-15 and Sep 9 through the end of the season...Lost his major league debut on July 22 vs. WAS… yielded a solo homer to Bryce Harper in the 1st inning…removed in the 6th after allowing 2 runs on three consecutive 1-out extra-base hits…a fourth run was charged against him after he left the game…his line: L, 5.2 IP, 7 H, 4 R/ER, 0 BB, 5 SO, 1 HR... Recorded his first career win in his second start, Aug 4 at SF over Madison Bumgarner…his only run allowed was a bases-loaded walk in the 4th inning…his 7 SO remain a career high…became the first Diamondbacks lefty to record at least 7 SO and allow 1 ER or fewer in an app of 6 IP or more within his first 2 career games.... Yielded 17 ER at the major league level, including 8 ER in his Aug 15 start vs. HOU before being optioned…his only home run allowed was in the 1st inning of his major league debut.... Pitched out of the bullpen in his third stint, going 1-0 with a 1.50 ERA (6-IP, 1-ER)... Was not on the Diamondbacks roster for the NL Wild Card Game or NLDS... Went 8-7 with a 5.39 ERA (122-IP, 73-ER) in 22 starts for Triple-A Reno…ranked 4th in the Pacific Coast League with a .266 opp avg... Ranked by Baseball America as the No. 2 prospect in the Diamondbacks system following the season. Named the organizational Pitcher of the Year after combining to go 10-6 with a 2.88 ERA (48 ER in 150.0 IP) with 152 strikeouts in 26 starts between Double-A Mobile and Triple-A Reno...Selected to play with Team USA in the MLB All-Star Futures Game at Petco Park…also started for the Southern Division at the Southern League All-Star Game...Earned SL Pitcher of the Week honors twice: May 30-June 5 and June 13-19...Named organizational Pitcher of the Month for June, going 3-1 with a 2.16 ERA (6 ER in 25.0 IP) and 27 strikeouts, including 22.0 consecutive scoreless innings from May 28-June 15...Tabbed by Baseball America as the No. 10 prospect in the SL and No. 20 in the Pacific Coast League following the season. March 30, 2019 Tampa Bay Rays placed LHP Anthony Banda on the 60-day injured list retroactive to March 28, 2019. Tommy John surgery. 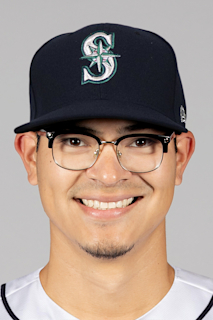 March 28, 2019 Tampa Bay Rays placed LHP Anthony Banda on the 10-day injured list. Tommy John surgery. October 1, 2018 Tampa Bay Rays recalled LHP Anthony Banda from Durham Bulls. June 2, 2018 Durham Bulls placed LHP Anthony Banda on the 7-day disabled list. May 27, 2018 Tampa Bay Rays optioned LHP Anthony Banda to Durham Bulls. May 15, 2018 Tampa Bay Rays recalled Anthony Banda from Durham Bulls. May 13, 2018 Tampa Bay Rays optioned LHP Anthony Banda to Durham Bulls. May 12, 2018 Tampa Bay Rays recalled Anthony Banda from Durham Bulls. May 11, 2018 Durham Bulls placed LHP Anthony Banda on the reserve list. March 18, 2018 Tampa Bay Rays optioned LHP Anthony Banda to Durham Bulls. October 10, 2017 Arizona Diamondbacks activated LHP Anthony Banda. October 4, 2017 Arizona Diamondbacks reassigned LHP Anthony Banda to the minor leagues. September 9, 2017 Arizona Diamondbacks recalled LHP Anthony Banda from Reno Aces. August 17, 2017 Arizona Diamondbacks optioned LHP Anthony Banda to Reno Aces. August 4, 2017 Arizona Diamondbacks recalled Anthony Banda from Reno Aces. July 23, 2017 Arizona Diamondbacks optioned LHP Anthony Banda to Reno Aces. July 22, 2017 Arizona Diamondbacks recalled Anthony Banda from Reno Aces. March 14, 2017 Arizona Diamondbacks optioned LHP Anthony Banda to Reno Aces. November 18, 2016 Arizona Diamondbacks selected the contract of Anthony Banda from Reno Aces. July 14, 2016 Reno Aces activated LHP Anthony Banda from the temporarily inactive list. July 9, 2016 Reno Aces placed LHP Anthony Banda on the temporarily inactive list. June 23, 2016 LHP Anthony Banda assigned to Reno Aces from Mobile BayBears. April 2, 2016 LHP Anthony Banda assigned to Mobile BayBears from Visalia Rawhide. March 3, 2016 LHP Anthony Banda assigned to Arizona Diamondbacks. April 6, 2015 LHP Anthony Banda assigned to Visalia Rawhide from Kane County Cougars. April 4, 2015 LHP Anthony Banda assigned to Arizona Diamondbacks. July 31, 2014 Anthony Banda assigned to South Bend Silver Hawks. September 15, 2013 LHP Anthony Banda assigned to Wisconsin Timber Rattlers from Helena Brewers. June 19, 2013 Anthony Banda assigned to Helena Brewers from AZL Brewers. June 16, 2012 Anthony Banda assigned to AZL Brewers from Milwaukee Brewers. June 15, 2012 Milwaukee Brewers signed Anthony Banda.